Wikus Ceronie was on his way back to South Africa after a working trip in Mozambique. 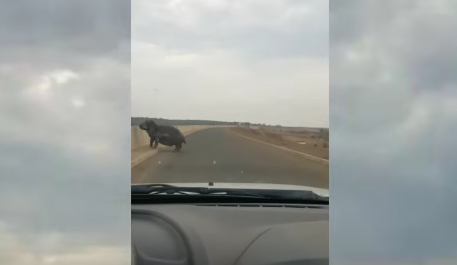 The journey took an exhilarating turn however, when Wikus came across a lone hippo on a bridge whilst crossing the border from Kruger National Park. ‘There were people walking around in the nearby vicinity so I automatically assumed this hippo was used to humans. I was quite fascinated by this so I took out my phone to start filming, ‘ Wikus told LatestSightings.com. This mesmerising moment was captured on film by photographer Miguel Pereira off the coast of Portugal. This footage shows a tiny elephant baby stuck in a watering hole, unable to get up the slippery bank. However it has nothing to worry about. Be warned, this is not for the faint hearted.